About two weeks ago I once again attended the annual Music Place Jazz Summer School hosted by the kind folk at The Cinnamon Club in Bowdon. It was another exhausting week of scales, arpeggios, triplets, grooves, vibes and mixed emotions. Don't get me wrong, it's a really great week but it can expose the raw side of one's ego when you realise what you (still) can't do, though it's all too easy to forget what you have actually learnt. I have to say I found this year quite a tough one as I wasn't really all that happy with my playing during the week. That's not to say I didn't have a good time and learn a good deal to boot. The evening jam sessions in particular were excellent, being expertly facilitated by Suzanne Higgins. I had originally made the decision not to attend this year as I went on Mike Walker's fab guitar retreat in Andalucia, Spain. However my other 'arf, Jane has taken up jazz ivory tinkling and decided to do the course this year so I figured I'd go along partly to keep her company. The set up for most days is 'sectionals' in the morning which is based on your instrument, and ensembles in the afternoon roughly grouped by standard. The course tutors this year were Mike Walker (guitar), Iain Dixon (horns), Andy Schofield (horns), Les Chisnall (keys), Caroline Boaden (drums) and Alec Dankworth (bass). Having been on the summer school before and having had one to one lessons from Mike, I suspected the guitar classes might be going over stuff I'm fairly familiar with but it was a pleasant surprise to find that he took a different tack this year. One thing that's been noticed is that the general standard has improved over the last few years and the bar has definately been raised. In the guitar class everyone had attended the course at least once before so we were able to look at some new areas including the finer subtleties of triplet swing feel. We went into this in quite some detail and it was clear there's a lot to getting this feel spot on. Mike employed the phrase 'Dave the dappled cat' to good effect to help master the timing of the swung '2 and' beat of the charleston groove landing on the word 'cat'. Some interesting exploration of the melodic minor scale was very welcome too, with it's altered and lydian dominant modes useful over certain applications of dominant chords, and the Hitchcock/Debussy favoured mystical locrian natural two mode. For sure no one was left in any doubt as to how to swing the metronome on the 2 and 4. There were some great players in my group for the afternoon ensemble sessions. This was good for keeping me on my toes and I was sometimes left for dead if asked to play the melody for a tune. Mike had us running down the 1st, 2nd, 3rd and 5th notes of each chord of 'Solar' [I never got his "they say so-la in Liverpool" joke] and I came up with some particularly tasty 'clams' [= very wrong notes] when forced to improvise just using these notes of the scale. It's surprising sometimes how the slightest rearrangement of a scale or arpeggio brings you to a grinding halt. We did a lot of work on swing feel in the ensemble class as well, alternating between playing all of the '1 and a, 2 and a' triplet beats and then dropping playing but still feeling the 'and's to get the quaver swing feel. 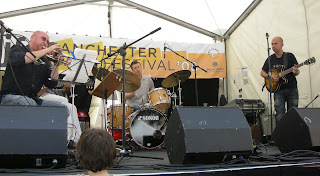 So it was tears all round on Saturday 26th July for the last day of this years Manchester Jazz Festival. The sun hung in there again for first act of the day, the Tim France Quintet in St Anns Square. The festival guide promised "a no-nonsense straight ahead repertoire" and this is exactly what we got, delivered to the highest standards from some great Manchester players including Tim on sax, Richard Iles on trumpet, Pete Turner on bass, Eryl Roberts on drums and George King on piano. This was great stuff actually. All the playing was bang on providing us with a really entertaining start to the day. A particular treat was 'Fistful of Haggis', a Horace Silver style latin groove featuring some fab slurry mute trumpet playing from Richard. Other goodun's were Wes' 'SOS' and Julian Adderley's 'Jive Samba'. Terri Shaltiel followed with some classic style powerful blues material mixed in with a few soul classics. She's a decent enough singer for this type of thing but some of playing was a bit rough at the edges and it didn't do a great deal for me. On the face of it putting the Wizards of Twiddly in to close the afternoon looked to be a brave and foolhardy move by the festival organisers. Judging the book by it's cover you'd be forgiven for expecting a death metal set from this lot. Sure enough there was plenty of unabashed widdly twiddly playing and some was indeed on the heavy side but there was plenty of light and shade there as well. In the end I think a cross between the Red Hot Chilli Peppers and Peter Gabriel era Genesis was fairly near the mark. Some curious almost folky melodies popped out amongst the politically motivated tunes such as 'Big, Bigger, Bigot'. Including this band was stretching the festival 'jazz' brief again but they succeeded in getting the Saturday St Anns crowd on their side. For pogo improvisations this band definitely have it. In the evening it was over to the festival one-off pavilion tent venue outside Urbis. The venue worked really well I thought and it was nice to be somewhere a little different. The sound and lighting was pretty good and I quite liked the feel of it. The first part of another double bill was a tribute to the late Emily Remler from guitarists Deirdre Cartright and Kathy Dyson. Despite being a guitar player myself I'm not normally a big fan of guitar duos but these two did have a certain something. The crowd seemed attentive and well disposed which made for a friendly atmosphere and a quite charming little set. I was pleasantly surprised how much I enjoyed this one. The final act of the evening was latin band 'Apitos' with it's 'Made in Manchester' set. I think this was a one-off festival special, the band normally going for an authentic latin thang. The gig consisted entirely of latin versions of Manchester pop and indie classics from the likes of The Smiths, the Happy Mondays and M People. Fun it was meant to be and fun it was too. Hearing a latin version of 'Heaven Knows I'm Miserable Now' was certainly quite a strange experience complete with it's percussion breaks and the full works. It took them no time at all to get the dancing going and the band went down a veritable storm. This man was charmed too. Another Manchester regular, Paul Farr kicked off another not so regular even sunnier Friday morning 25th July with his cryptically named Paul Farr Band. This was another quite funky bluesy Scofieldly affair with some tasty 335 guitar playing of exactly the sort I like, nicely overdriven when appropriate and teasingly just sneaking off into controlled feedback sustain at Paul's leisure. There were some good tunes too though they were perhaps getting a little samey sounding over the course of a full hour. This was the first time I've seen Neil Yates added to this band who's great line up consisted of Luke Flowers on drums and Sylvan Richardson on bass. Neil was using a delay unit very effectively to overlay multiple horn lines creating a horn section of sorts. He also providing some nice ambient drone layers to backdrop the guitar and some general swirling reversed and pitch shifted sound effects enhancing the overall aural pleasure. This really added to the impact of the band and the material. Probably the best guitar improvising came on a slow tune near the end that I wasn't so keen on overall but it provided a good foil for Paul to kick on. It was good to hear a band that seemed well rehearsed and really on it as well. In the same spot a good few hours later the rather odd looking Crill Bones took to the stage with fake blood stained torn dinner suits. In the course of the set guitarist Jasper Wilkinson alluded to the stage attire hinting that the story behind it may be libelous so we'll have to imagine that one. Great fun they were too. Good time vibes with some nice grooves and decent lines and horn hooks over the top. Some nice and solid funky stuff too from Ollie Collins on bass, especially on a track featuring some Parliment style wah-wah sounds and a nice bit of improv. Jasper was a very entertaining frontman and quickly got the afternoon crowd on his side. It was over to the Green Room for the evening double bill. First on was the solo piano of Robert Mitchell. Robert has a highly impressive and enviable technique but the material left me cold. It was harmonically very complex and too dense and rich I found. It's possible that it would reward repeated listening but was too much to take in one go. Even so I still think there was too little variation in the density and I was wishing for some of the sparsity and thoughtful note placement of Les Chisnall. That well worn adage comes to mind. The second half of the bill brought a dramatic shift of gear with the shamelessly retro fusion of the Polo Orti Quintet. It was a loud and high energy set featuring some nice playing from ex Manchester based sax player Fermin Rivero, now based back in Spain. Well there was no disputing it was classic 70s jazz-fusion through and through and received a mixed response from the audience though many clearly loved it. I think again it could have done with a bit more variation in approach for me, particularly from Polo's keyboard sounds. He clearly loves his Herbie style synth tones and stuck with them for the whole set. An entertaining enough evening but I guess I probably wouldn't end up checking these acts out again I suspect. Back again to some real proper hot sunburny sunshine in St Anns square for day 7, Thursday 24th July. I've only seen Mrs Colombo once before and it was in this exact same spot two years ago. They were one of the better acts that year and I was keen to check them out again. On that occasion the line up included the excellent Sam Smith on piano but he's now based in London I believe and it was left up to the addition of Jo McCallum on sax to help fill the gap. There was interesting material here but the band seemed quite hesitant and the performance lacked a bit of sparkle. The material did also sound quite sparse without the keyboard though guitar player Jim Faulkner did his best to fill the gap. What I think was the newer material worked best, especially 'Vague', a King Crimson style guitar workout not dissimilar to Crimson's 'Ladies of the Road'. The pulled off a passing version of 'Prudence vs Provocation' but again it lacked the piano. Potential here but needs a kick up the proverbial. 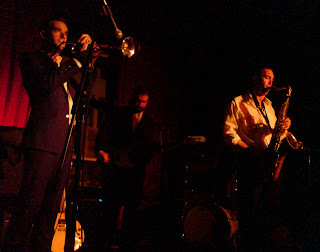 My affection for 'The Blessing' is well documented on this blog and tonight at Matt and Phreds they again hit the spot, though I was a bit disappointed that regular drummer Clive Deamer wasn't in attendance. No big deal it turned out as the replacement (didn't catch his name I'm afraid) did a great job with some fab high energy beating of the beats. The raw bass riffing of Jim Barr was even rawer than usual and horn players Pete Judge and Jake McMurchie kept the energy levels high and momentum moving forward apace. If anything it was a sliver of a smidgen too raw, possibly from the extra force coming from the drums but still a great gig and another highlight of the festival. There are moments when things align. The frequency and interval varies. It may take months. It may take years. It may happen in a fleeting moment or take many millennia. Everywhere there is scale and relativity. Particles line up and resonate in mutual empathy. Broken clocks tell exactly the right time. Birds migrate. Some alignments are intentional, some occur by chance. Most events conjoin these opposite and coincident bedfellows. And so we happened upon one such event on the evening of Wednesday 23rd July 2008 at the Royal Northern College of Music. 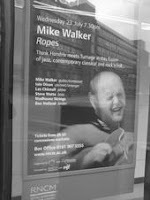 Such was the sense of occasion and expectation for ‘Ropes’, a specially commissioned piece by the guitarist Mike Walker for this year's jazz festival. Whilst he has a long established and enviable reputation as a premier guitar player on the UK and world jazz stage, it has only been this year that we've finally had an opportunity to hear Mike’s compositional skills in full, first with the recent release of the ‘Madhouse and the Whole Thing There’ album in May and now with the epic ‘Ropes’. The suite employed a twenty two piece string section alongside the clarinet of Mike’s long time collaborator and friend Iain Dixon, the piano of Les Chisnall, the double bass playing of Steve Watts and the drumming of the mighty Adam Nussbaum. Ropes met the occasion and surpassed it, sweeping us along with its soaring beauty and near overwhelming intensity. A touching version of ‘Still Slippery Underfoot’ from the Madhouse album opened the set, its mysterious opening piano chords accompanied by the haunting cello of Hannah Roberts before giving way to the main melody on the clarinet. Headbound followed, opening with a dark and pensive repeating piano sequence. A soft cymbal accompaniment from Adam Nussbaum eased its way in, lifting the dynamic and opening the way for some classy improvisation from Iain and Mike with some graceful cushioning from the string section. A harmonics enhanced solo guitar introduction from Mike steered us into the warm and latin-tinged wistful tones of ‘Wallenda’s Last Stand’. The tune seemed to capture a certain sense of regret and isolation in parts, a mood deepened by the plaintive solos from the violin of Ben Holland and the sax of Iain Dixon. Another short sweeping solo introduction from Mike opened the smiling nostalgia of the swing feel based ‘Clockmaker’. A fluid solo from Iain set Les up for a particularly joyful response that warmed the heart. The closing melody created a good feeling all round, returning the hope that ‘Wallenda’s Last Stand’ had doubted. A subtle and savvy dynamic drum intro from Adam Nussbaum kicked off the fast swing and metrical melodies of ‘Last to the Line’. There was some really sweet, clean and boppy improvising from Mike on this tune. After the break Mike introduced ‘Moored to Water’, a collective free improvisation from the string section. To hear a 20-piece classical string section improvising was both a surprise and very effective. Mike explained a little about the layered concept behind ‘Ropes’, the broad theme being the lines on a music stave and the harmony of the chords as ropes hanging down like threads. The music also evokes many of the uses of ropes, both good and bad, from the light sounds and harmonies of sea shanties to the darker sounds for the darker history. The first movement of Ropes opened with a series of short block string chords of varying lightness and darkness. A solo clarinet introduction of an upright folk melody then got the movement going, leading into a lush string wash and some punchy lines delivered with panache by the string section. Ropes part two began with a metrical piano phrase that became the outline for the tune’s repeated sequence and its slightly off kilter rhythm, hinting at the sounds of Steve Reich. The really quite sublime Ropes part three featured the marvellous playing of Iain Dixon on clarinet, backed by sweeping strings and evoking some intense emotions of melancholy, longing, reflective contemplation, quiet and calm resolution, reconciliation and the happiness of meeting old friends. So much was evoked by the piece and all echoed in the sense of occasion of this special evening. A long shared moment of return, closure and beginning again. A sustained standing ovation brought the musicians back for a reprise of ‘Headlong’. A lightness and relief opened the space for an incredibly relaxed, gentle and dreamlike seductive start to the track. The momentum slowly built with Mike eventually burning us up with the most searingly powerful improvising of the evening. A really amazing, emotionally exhausting and truly unforgettable evening.